On an internet filled with complicated products, with complex legal terms and inscrutable business models, simplicity is something we all crave more in our digital lives. Write.as was built to be that simple space for expressing yourself — a reprieve from the bloated, distracting web. Yet as we've fought to stay simple over the years, we've grown more useful to more people — no easy feat while keeping such a focus. Today, we're evolving our pursuit of simplified complexity with Extend Write.as, our add-on directory and marketplace. Extend Write.as is a place for everyone to extend their normal abilities on the platform with new features. It's a place for our new experiments, alternative defaults, and more publishing tools. It's where you'll find new ways to customize your blog, and new tools to offer your readers. Next, you'll find new ways to customize and export your blog on Extend, as well as our alternative web editor, the Classic Editor — currently being tested in Write.as Labs. Beyond that, you might find Extend features as part of WriteFreely, or even build your own features that we'll then showcase. We're excited to launch this next stage for the platform, and can't wait to start adding more capabilities. As always, we'd love to hear what you think on the forum! Sometime in the past few weeks, Medium abruptly deleted third-party access to their publishing API. There was no warning before, or notice after, this happened — apps just stopped working (including ours). So unfortunately, we've removed our Medium integration. You'll no longer see the option to connect a Medium account or cross-post to one in the editor. We contacted Medium's team to see how we could regain API access. But then, after a little more thought, we decided to make this change permanent, and not continue support for their platform, regardless of what their response is. We recently experienced an interruption with API, and the ability to generate new oAuth-based applications has been restricted. I have reenabled that feature. This doesn't really explain why our 2-year-old integration suddenly stopped working (we didn't need to generate a new application). So I'm asking for more clarification. Our original goal in supporting the Medium API was to create more bridges between different web silos. That was part of the promise of Medium back when it started, after all — a network of blogs, instead of individual islands. When they opened their API, we knew that would be the perfect chance to help writers connect with more readers. We trusted that Medium might not do what many VC-funded platforms have done before: open an API, attract developers and users, grow, then shut it all down. Unfortunately, that's exactly what they did. And unlike their previous pivots, they didn't even give the courtesy of a small heads-up. It's this pattern of disregard for everyone else, as they clamor for a business model, that is mostly driving our decision to part ways. They've done a lot of good for the web (and indeed helped inspire Write.as). But we believe there's a better way forward, and based on their decisions, they probably won't be a part of it. With this change, we'll be honing the focus of our product even more, evolving the open source software behind it all, and continuing to build a sustainable, human-centric platform for publishing on the web. 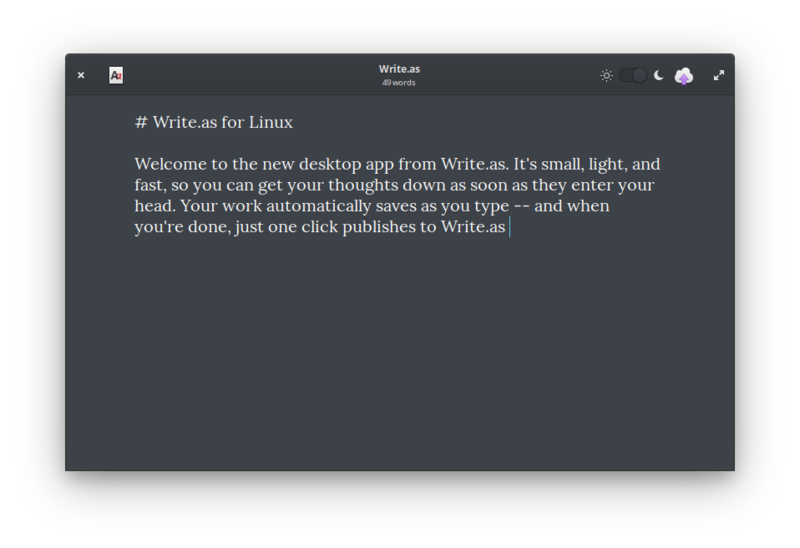 Today we're happy to announce our very first desktop app, Write.as for Linux! The app is a distraction-free editor built for your words that lets you compose posts on your machine, offline, and publish them whenever you're ready. With this, we want to give writers a lightweight, reliable space they can always go to to jot their thoughts down and share them with others. You can install it now for free, evaluate it as long as you want, and purchase it for $25 if you want to keep using it. We apply discounts for existing Write.as subscribers, and let you choose your own price if you'd rather pay less, or get more value from it than what we charge. Behind the scenes, the app is powered by our command-line interface (CLI), and will build upon that in future updates. Today you can publish anonymously with the desktop app and then manage your posts with the CLI. In the future, you'll be able to do more directly from the app, including publishing to your blog, without going into the command-line. This app, like the CLI, is free/libre software. You can see the source and freely modify it under the GPL. If you'd like to contribute, we'd love your help on our GitHub repo. This is the first step onto the final platform we want to build first-party apps for: the desktop. We're building native apps for all major operating systems, starting with Linux, then moving on to macOS and Windows. If you'd like to help us finish our Swift-based macOS app or build our Windows app, please get in touch — we're hiring developers on a contract basis to help us get there! For now, we'd love to hear what you think of the app. Stop by the forums and tell us your questions, ideas, and thoughts so far. Today we're joining the fediverse, a network of interconnected social platforms where instead of being able to only talk to people within a single platform, like on Facebook or Twitter, you can interact with others across different platforms. Specifically, we now support ActivityPub, a protocol spoken by popular platforms like Mastodon (an alternative to Twitter). This means that you can now enable federation for your Write.as blogs, and they'll get their own handle that people can follow from the fediverse. To follow this blog, for example, you'd open Mastodon and search for @blog@write.as. Click follow and you'll start seeing our future posts in your timeline, where you can favorite or boost them to your followers. To get started, you can create a new federated blog, or if you already have a blog, just go to your blog settings and check Enable federation. Let us know what you think on the forums, and keep an eye out for more improvements by following us on Mastodon! P.S. just a sneak peek: we've also started on the second half of our plans for the fediverse, a long-form reader called Read.as. More updates on that coming soon, too! Almost two years ago, shortly after launching blogs and accounts, we created our Casual subscription. At $10, this is the perfect plan for people who want a little more than what our free tier offers, but don't need much more. In fact, today it's just as popular as our Pro plan. Since then, we've added SSL support to the custom domains you can add to your Casual blogs, and Read Write.as has grown to an audience of thousands per month, including readers across Twitter and the fediverse and those who visit Write.as just for the stories. Because of this, and largely to get rid of the awkward “$0.83 per month” pricing, the price for new Casual subscriptions will go up to $12 per year starting August 1. Existing Casual users, including any who upgrade before August 1, will keep their $10/year rate for as long as their subscription is active. After this, you likely won't see any changes to the Casual rate, except perhaps with a new multi-year payment option. If you'd be interested in this, let us know on the forum! We left Facebook in March — that is, we decided none of our humans should have to interact with our official page anymore. Today, robots carry our Twitter posts there to keep any followers in the loop. Here at Write.as, over the past three years we've built a platform guided by a vision of digital spaces where one can be themself and freely express their dreams, thoughts, and desires without scrutiny; places where we can remember our own humanity in that of others, and can connect over that shared dream with any person across the globe, thanks to the internet. We understand that many people don't have a choice in using Facebook because it's where their friends and loved ones hang out and talk. We know that many don't mind it if their every personal detail is being catalogued by this platform (among many others) — if they're happy, we don't want to change their mind. But we and millions of others are working on a new model for the web. One where communities are formed around human interests instead of corporate ones; where you and I can socialize without also being told to buy more things we don't need. We're building this for you and for us, whether you want to #DeleteFacebook or love seeing advertisements relevant to your interests. We're building it so that at least we'll all have a choice. So our humans have left Facebook. We hope you'll all come along with us on our journey to building a better model for the web — but if not, we'll see you when we get there. The original announcement on Facebook. 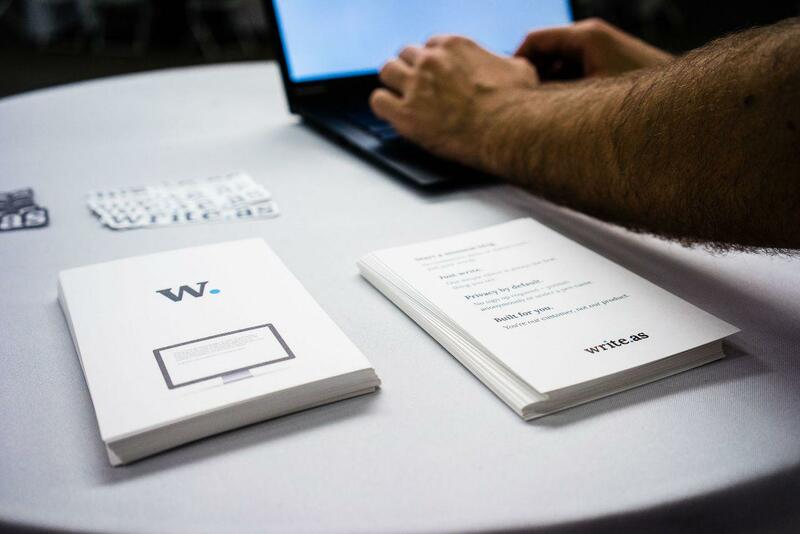 The Write.as team traveled up the coast to New York City this week to show Write.as off to the world at TechDay NY. We took the train up from Florida early in the week, brainstorming and planning as we watched the subtropical, coniferous forests turn temperate and deciduous. After nineteen hours we arrived at Penn Station and lugged everything a few blocks to our hostel in the heart of Chelsea. Over the next few days, we refined our 4-minute demo and some goals for the event. As Thursday approached, our founder, Matt, sent out some updates and practiced his pitch to writers and the press. On the big day, we very seriously set up our very serious booth. 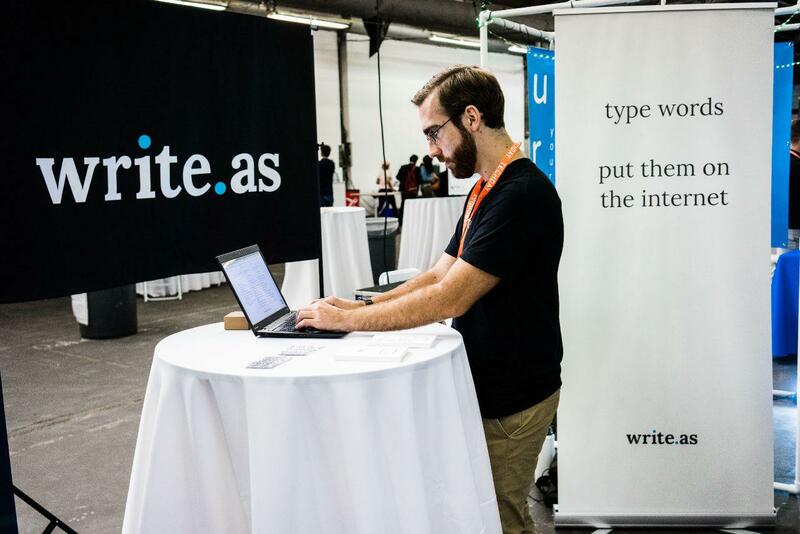 The next eight hours was a whirlwind of people stopping by to ask about the product, presenting our demo, and learning about all the different ways people could find a tool like Write.as useful. For all the preparation, the final event flew by in an instant. But we had a great time getting out from behind the screen to meet everyone in the real world — and we're looking forward to the next event like this! We love open source software at Write.as. We use it every day, from the operating systems our developers use, to the servers and bits of code our platform runs on. We open source many of our libraries and clients, and are moving towards open sourcing our entire web application. Recently we saw an open source project, Liberapay, suddenly had their Medium publication taken down with only 12 hours notice — apparently the result of some automated process — and we stepped up to offer them a discount. They ultimately had other plans, but we thought we should make that offer official, and open to the entire web. So we did. If you maintain an open source project and need a maintenance-free place to write about it, now you can get our Casual features for free (or 25% off of Pro)! 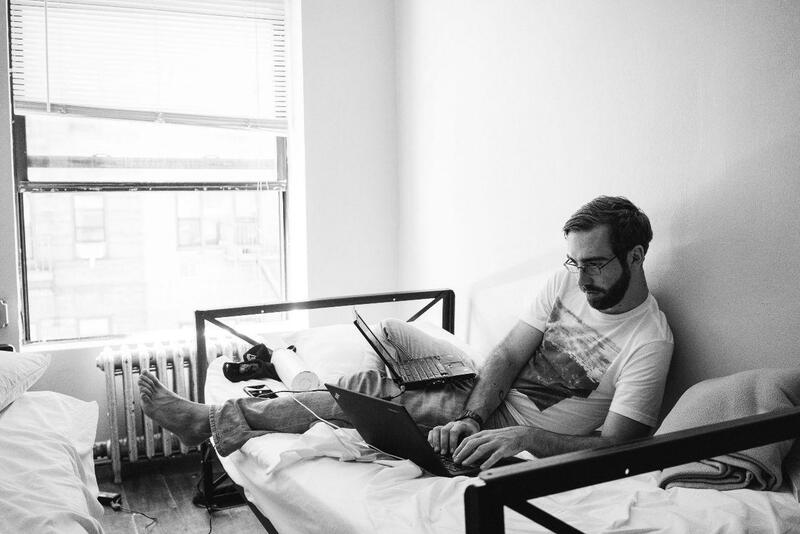 Our Casual plan lets you use your own domain name (with SSL included) and publish to an audience on Read Write.as — so your hosted blog can still be yours, and you'll have readers from day one. 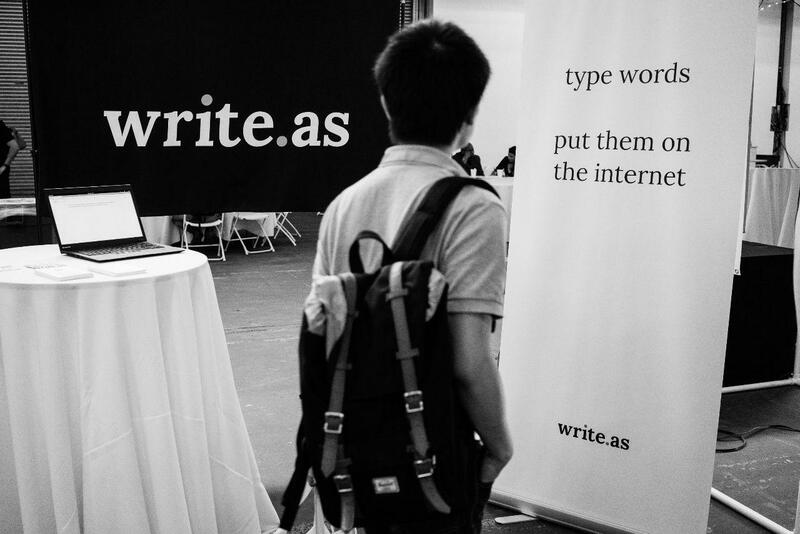 We also take a strong stand for free speech on Write.as, don't let algorithms remove content, and are funded by our founder and customers — so your words will be safe here. 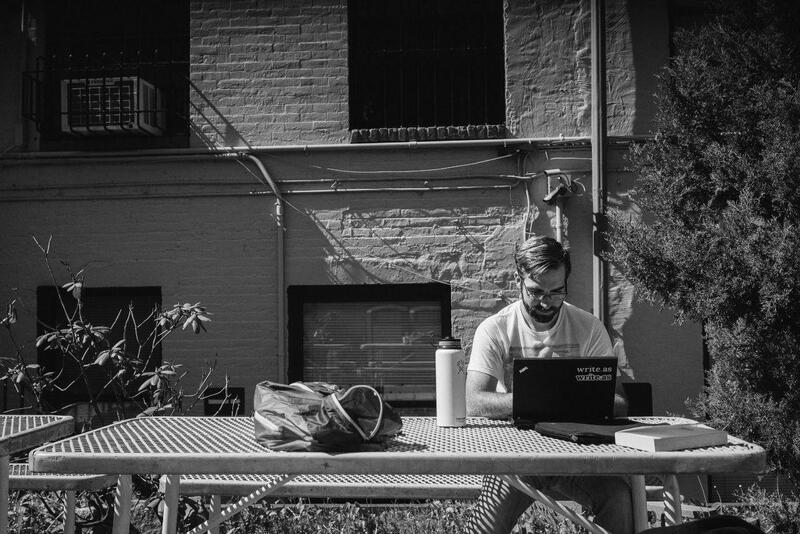 We hope this will help more open source software maintainers effortlessly get their words on the web, so they can spend more time creating awesome software that powers the world. And if you're a student, non-profit, or educational institution, ask us about other discounts we offer! We're excited to bring in 2018 with a long-requested feature: tags for your posts. To get started, you'll do what you already know how to: include a hashtag in your post, like #newfeatures. Readers will see a clickable link (like that one) to a page that lists out all posts using that hashtag. Each tag even has its own RSS feed, so readers can subscribe to the topics they enjoy! If you've already included hashtags in your posts, you don't need to lift a finger — all those posts are magically searchable now. If you haven't been tagging your posts, now is a great time to start! We hope this makes Write.as useful in even more ways. As always, let us know what you do or don't like about tagging — and happy new year! One of the most exciting parts about building a simple app and sending it out to the world is seeing how people use it. Often you'll see people find new uses that you never imagined — other times, they'll show you exactly what you should build. While a plain writing-focused blogging platform has been perfect for most people, we also saw some wishing to spruce things up with some graphics. So today we build that directly into Write.as with our early launch of Snap.as! Now Pro writers can upload photos, save a note with each (that'll come in handy later), and get the bit of text you need to add an image to your post. 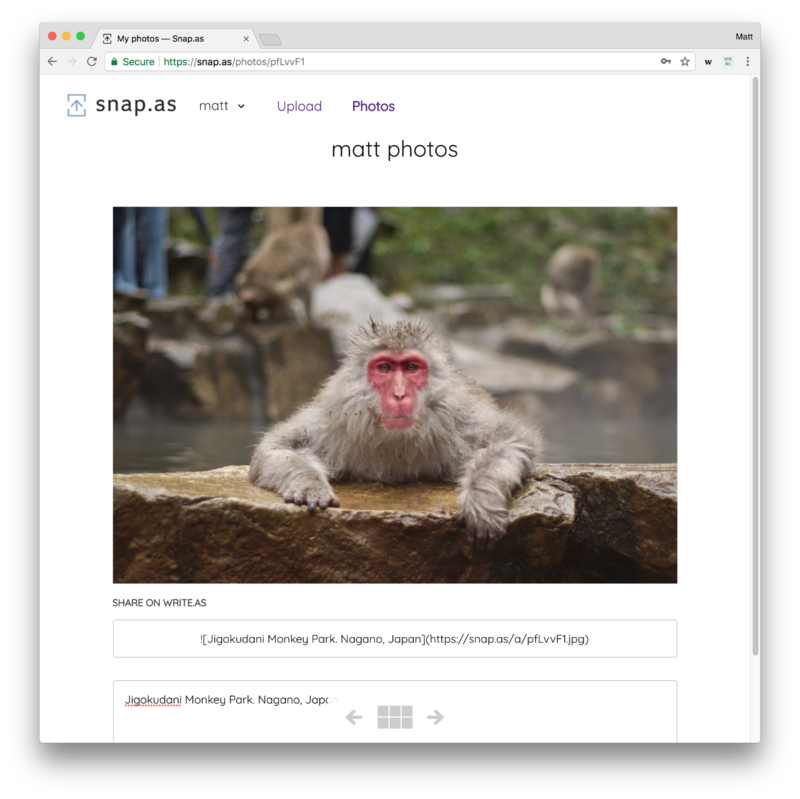 Like Write.as, it's simple, ad-free, and respectful of your time — and unlike free image hosting services, Snap.as is supported directly by you. That means we'll keep building it with your best interests in mind. To get started, simply sign up with your Write.as account and start uploading! This is just the start for us. Next you'll be able to import your photos already hosted on free services (so they have a permanent home), and eventually you'll be able to share beautiful, simple galleries. Check out our roadmap to see what's ahead, and as always, let us know how you like Snap.as! Enter your email to subscribe to updates.